Two hundred years ago, the city of Old Vinnengael was destroyed in a magical blast that killed many thousands and forever changed the lives of everyone in Loerem. Now, players in the Sovereign Stone d20 System Campaign Setting can travel back in time to explore the legendary city in the days before its downfall - meet its people, shop in its fabulous markets, discover its treasures, and encounter its dangers. Old Vinnengael: City of Sorrows delves into the details of the city and its inhabitants, the mysteries of the city revealed in detailed maps, vibrant NPCs, and incredible places first introduced in Well of Darkeness, the best-selling first novel of the sovereign Stone trilogy written by Margaret Weis and Tracy Hickman. Fully compatible with the d20 system, for the first time, the characters and events only described in the pages of the novel are brought to life, including the various members of the Royal Family, including Crown Prince Helmos, the Lord of Sorrows, and Dagnarus, the Lord of the Void. Included is a chapter on adventuring in Old Vinnengael, complete with new prestige classes and magic spells, as well as a full adventure that takes place on the eve of Old Vinnengael's destruction. 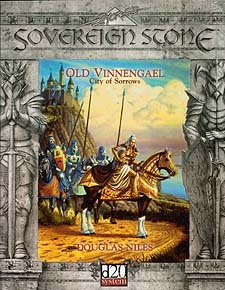 Old Vinnengael: City of Sorrows is a definite must-have for any fan of the world of Sovereign Stone.